Please visit Amy at the160acrewoods.wordpress.com for her wonderful Word Filled Wednesday. If your an animal lover please read yesterdays post. I am hosting a Saturday meet your pet. 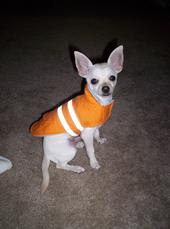 Send me a comment about your pet and a track back to your post. They say you can't teach an old dog new tricks. Actually she isn't all that old. She is about 4. This is my dog Daisy. And my husband told me I couldn't teach her any tricks. But I did. She is very polite when she meets anyone. She sits (somewhat on command). Actually on the 2nd or third command but she does sit and she sits up! She shakes your hand. And shakes your hand. And shakes your hand. The things she learns she learns well. For a couple of months I have been writing about Daisy and my other pets. And now I would like to invite all of you to come by. If you have written a post about your pet or know someone that does leave me a comment please. I'll come over and get a photo and link to your blog. 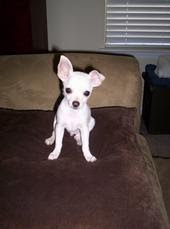 Please come by and visit us and leave comments so Daisy can come by and meet some new doggy bloggy friends. Or cats, or rabbits or horses. She loves them all. Each Saturday we will post about a new friend. So please come by and invite us over. I won't be posting a Show and Tell this week. It is almost Friday already. I write to you at 11:59. I am tired. It has been 7 days of emotion. 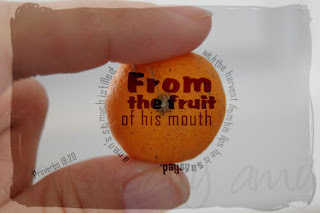 We prayed for and ministered to a young lady that gave birth to a little boy last Thursday. 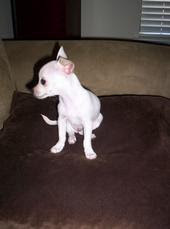 He weighed 1 pound at birth. Today she had to make the decision to remove life support. I was with her as she held her baby in her arms while he passed away. What do you say? This sweet young mother prayed that God would save her baby. She even said that Jesus healed a lady that touched his garment. Her sweet baby died in her arms. Even though we held her hand and told her God loves her how do you comprehend that when you are holding your child as he dies? ministry blog. I have a couple of posts about baby Christopher and there is a photo of him there. Please visit www.automissionmakeover.blogspot.com. I would be Blessed by your visit. Tonight I pray that Gina feels God's precence. Show and Tell Friday on Sat. Welcome to my Saturday edition of Kelli's Show and Tell. I am sharing with you today a very special piece of furniture that now sits in my kitchen. The photo's of this piece of furniture were taken by different people that visited or volunteered at the mission where I am the director. Because of lack of funding we have been forced to downsize and in order to pay rent and utilities we have had to sell our supplies and office furniture. This piece of furniture we were able to save. So I would like to share some of the photo's of it. This is a special photo because it shows how this table was used at Mission Makeover. Lots of prayers were prayed at this table. Dozens of girls met Jesus Christ at this table. And many of them made commits to follow Christ while sitting at this table. Today I am Blessed to be able to have it in my home. And I am prayerful that it will be only temporary. Thanks for coming and visiting please come back and visit often. Good morning. I hope you all are having a wonderful Saturday. 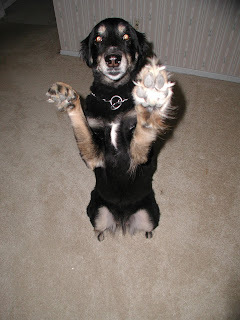 On Saturday I usually write about my dog Daisy and her friends and family. Today may we introduce to you Duke. He is my grand dog. He is an adorable puppy. And even has his own my space with photo's and video! He is one pampered,spoiled,rotten puppy! Duke was a surprise gift from my son in love to my daughter. He showed up one day from work carrying his baseball cap. Inside the cap was Duke! He fit perfectly in the hat. Duke is now riding in the bottom of the baby stroller and loves it. They are practising! I hope you have enjoyed meeting Duke. Here's a couple more photo's of him. I hope you have enjoyed seeing Duke my first grand dog. Daisy says to say hi. This photo today makes me smile. Deuteronomy 6:5-9 was my memory verse a few weeks ago. Here's how I did on it. These commands I give you today are to be upon your hearts. Write them on the doorframes of you houses and your front gates. If you read my earlier post this week you'll see I have had a rough week. But God has been with me/us and today our day is sunny and I feel like this spring flower. strength we needed to get past the obstacles we faced. Please come tomorrow to see my Show and Tell post I'll be writing about a very special piece of furniture. Please pray for my daughter and son in law tomorrow they will be traveling to a marriage retreat. It is 4 weeks till the baby is due. I sure hope that he doesn't decide to come early and they are on the road. I teased her yesterday we would have to call him "The Waco Kid" or "Austin" or something! Please pray with me for thier safety and Baby Zane's patience! Sometimes you have to lean and trust. And sometimes all you can do is wait. All you can do is put your hope and your trust in God. And actually that is what you should do all the time. But sometimes there are times and things that make you realize that really all you have is God. Right now with our ministry we are waiting on God. We are trusting in the Lord and we are not leaning on our own understanding. I began this blog "my journey" back to myself because I need an outlet. I needed to be able to seperate myself form the ministry and "get a life again" so to speak. And I have come a long way. I posted the other day just a little about my work with the kids that God has placed in my path. We have struggled for over 4 years to follow God's calling on our heart for this ministry. And over and over for 4 years we have had support from people and Blessings from God. And over and over for 4 years we have had people that have walked away and left us when things get rough. As the saying goes. And over and over for 4 years we have had people that have given up on us and have criticized and condemned. Right now our ministry. The ministry that God has given us is at a cross roads. Personally because we have invested so much in it. Our time, our mind, our hearts and financially we are exhausted. But everyday almost every hour we see the good that comes from this work. We cannot forget the smiling faces of kids that came to know God through the work of this ministry. And so we wait. We trust. We cry and we try not to ask questions. And we wish for more help and more support. We pray that people will answer the call and they too will trust and be patient and wait. We have learned that you cannot trust and depend on people. Because people will let you down. I have been let down. But I promise myself and I promise God and I promise the kids that I won't let them get me down. On Friday I met with the superintendant of the halfway house that we work with. He mentioned his concern that the issues going on with a couple of the girls would were me down. And I answered him saying. "It is not the kids that wear me down. It is not thier plight. It is the misunderstanding of the system. It is the misunderstanding of people that don't want to get involved too deep or not at all. 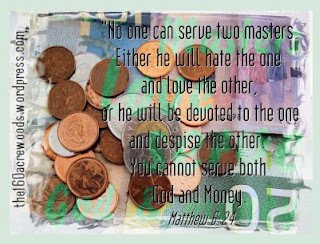 It is the misunderstanding and judgement of people. Not only judgement of the kids but judgement of me and every move I make. Every decision I make is judged." That is what gets me down. God is close to the broken hearted. People will let you down. People will hurt you. Circumstances will hurt you. Even though you pray and try to listen for God's answer sometimes it is so hard to know what he is telling you to do. And when you think you are following him and then bad things happen and people decide to criticize and condemn it causes you to give up and give in. But we can't do that. I can't do that. I do not know what is going to happen. I do know that I have a girl that is 18 years old that calls me two or three times a day. She left the halfway house telling the superintendent that she didn't cook and she would live on fast food. Today she is cooking. She is enjoying reading the cookbook that I gave to her and she plans meals. Meals that she eats alone. She eats alone because she knows that she is not ready to make good decisions yet about friends and the right people to trust. Today I pray that God sends his angels to protect her because I know that his protection is the only thing that she can depend on. Today I trust. I wait. I and I lean on God and the Psalms of David because all I can do is ask for strength. 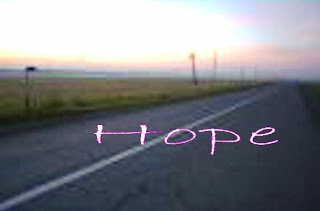 Because the only hope I have is in him. I just wanted you to see what I learned to do. Now I'll be adding my signature to my posts. I hope everyone is having a wonderful weekend. I am in between places I need to be. This morning and afternoon I was at a car raffle for our boys program. And tonight we have to be at a church missions fundraiser for our mission. I have a few more minutes. Maybe I can get that background done! Please visit all my friends today at Kelli's Show and Tell. I am not posting anything because I spent most of the day yesterday cleaning and working on the blog. I didn't get it done like I wanted to but it is a little springy looking. I had trouble getting a background. There is a little photo over on the right of that I wanted to be my background but I can't get it to work. Anyone know how? Do you like my horse calendar? I have been doing some tidying up and cleaning of the house and of the blog. I hope you like what I have done. Already I added the calendar to the sidebar. I love the photo's of the horses. I never remember what day it is and there isn't space on the desk for a calendar. It is shooved into a container along with the calculator and some other stuff. I need to clean the desk. For now I am working on the house and the blog. I have tried to change the background and can't quite get it yet. So I guess I'll have to add the dummies at blogging to this one. I hope I can get it all spruced up and pretty so when everyone visits tomorrow for Show and Tell it will be all pretty and new! Lean not . . . I copied this photo from a free photo thingy just because I thought I would put a verse on it like Amy does over at the 160acrewoods but I haven't taken the time to do it. Tonight I got words of encouragement from Amy at just the time that I needed it. Tonight I need encouragement. Tonight I need prayer. I started this blog as my attempt to get my life back. You see for the last 4 years I have been totally 150%abosorbed in ministry. Don't get me wrong I love,love,love what I do!!!!!!!!!!!!! But I had let myself and my life take the backseat. I mean look at my post from a couple of Fridays ago and you'll see my front porch nightmare. And also my photo from yesterday of my "junk" drawer. My husband and I both have consumed ourselves with this ministry. I do not say that in a negative tone. And if it comes across that way please do not take it that way. I have to say again I love what I do. I always wanted and prayed and wished for more than two kids. I know now why God didn't give me more than my two kids. Two reasons #1 my daughter whom I love more than anything else is wonderfully spoiled rotten and is a total hand full. And #2 I have all these kids that I work with through the ministry. If I had a house full of my own I would not be able to work with and help all the other kids. And that is exactly my problem tonight. I hurt for all my "adopted" kids. I work with kids that have been "in trouble" they are either incarcerated now or on parole. I have a mentoring relationship with a girl that is on parole. She was finally removed from the apartment and placed into another apartment in the same complex. One of the x roommates climbed into an open window last night came into her apartment stole her phone and a book (an inspirational book by a well known pastor that I had given her) hit the girl in the face and left. This morning all three girls had to report to their program (normal reporting) The incident was reported. The girl that did the assault admitted to hitting the other girl. They were all allowed to leave. The girl that was hit was told to go home lock her door and not talk to the other girls. And that the girl that hit her would be "picked up" in the morning. This just kills me. I hurt for the girl that was hit. I hurt for the girl that did the hitting. When the girl that was hit asked the caseworked "why do they get away with all this." (being caughting stealing, smoking pot and the assaults) the caseworker answered. "We are trying to work with them." Hello. . . I am really venting now but what does that mean? I mean really leaving her in that situation. Not putting her ( the assaulter) in anger management (not that I agree with all thier so called programs) basically she is allowed to do what she wants. It kills me. All three of these girls need prayer. And not only them but the next girl that goes if this girl leaves. It is so frustrating to me. I really need to ask all my regular volunteers and supporters to pray for all of them but it is so hard because I can't share details about the girls because they are juveniles. So I ask all my friends out there that are reading me. All you guys that are lurking out there. All you guys that I read and leave comments and tell you I am praying about your situations. Will you please pray for my "kids". God gave them to me because no one else has cared about them. God only gave me two of my own kids because way back 20 years ago he knew that these girls would need me. I have more kids to love than I could have every dreamed of. Please help me today and pray for my kids. I don't understand why things happen the way that they do. I did not understand why God did not answer my prayers oh so many years ago. I knew that I would be a good mother. A "mommy" and I deserved lots and lots of kids. But I do know now that if I had the 8 or more of my own that I wanted that I would not be able to help the kids that I do now. And tonight I am thankful. I am thankful that God allows me to help these kids. Today is our food pantry day. Thank you Amy for filling in for me. So is there any easier way? This is me. This is my camera. Help. Hopefully this will be a sticky post. I am labeling it "dummies at blogging" because it might not stick. LOL. Actually it really isn't me but I feel like it is my camera. It won't talk to the computer. And it is kinda big and bulky. And I just need a new one. So please does anyone out there have any suggestions for a really inexpensive user friendly camera that will talk to the computer! OK so up there is my stick post. Now I didn't do it the way some of you probably do it. I ended up copying and pasting it. Is that how ya'll do it? Here's my post for the day. I am doing spring cleaning and gardening. I am embarrased to say this was my junk drawer. Amazing isn't it. 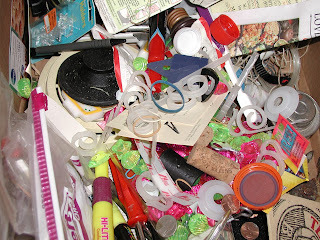 What does your junk drawer look like? Well mine doesn't look this way now. Actually there is nothing in it. All that stuff got sorted (like they do on t.v. on all those shows)into piles and distributed to new places. A bunch went into the trash for example the Chinese resturant menu (the resturant closed two years ago . 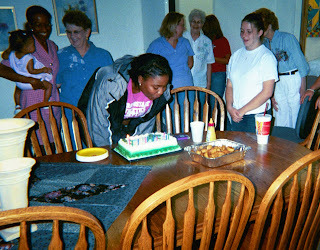 . . now do you see why I was embarrased. Actually to tell you the truth I didn't sort it this week. I did it about a month ago and haven't told anyone because I mean my gosh would you? I can't show you a new photo because well I need a new camera. But I can show you some of what is going on outside. I have cleaned the front beds. We moved rock on Saturday and I did a new border. I can't wait till it's done and I can't wait to show you. We planted blooming daffodils that I got free. Did you hear that! Free. Yes I am frugal. I planted two pots of begonias. And some hyacinth bean seeds to grow up the arch. So in a few weeks it will not be the unsightly "Munster" house that Cowboy called it. Check out my friday post from a couple of weeks ago if you have the stomach for it. LOL. Another embarrasing photo. I really need to get that new camera so if your out there and your lurking and haven't left a comment because you just don't know what to say about some of the things that I say. Please leave me a comment about your camera and give me some suggestions. Until later. Have a fun day. And be Blessed. 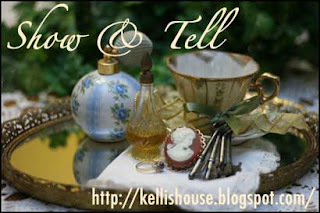 Welcome to Show and Tell Friday hosted by Kelli. Please go and visit her blog kellishouse.blogspot.com Thank you Kelli for hosting. My Show and Tell this week is of part of my den/game room. 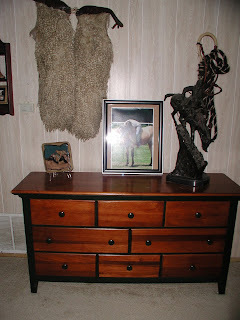 It is the room with the horse themed bathroom that I featured a couple of weeks ago. And also the horse book shelf with the little red boots that everyone liked. Today I am showing one more wall and the items there. 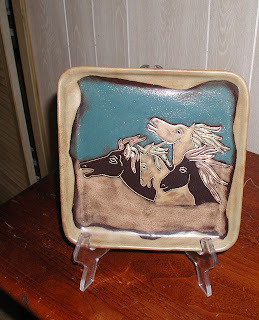 First is a wonderful handpainted pottery plate that my sister bought me. She lives in Seattle now but she lived in Portland when she sent this. She travels alot and goes to artisian type events so I am not sure where it was bought. I just love this plate. It is sitting on our dresser. In this house the dresser really didn't fit in the bedroom. We had it there for almost two years. And just recently I decided it would work much better in the den. We didn't use most of the drawers because we hang our tshirts and stuff and we have a matching chest so it got moved to the den. It actually matches my den furniture too so it fit great. You'll notice that our theme in the room is a bit eclectic. (I am sorry for the glare on the photo) On the right is a fullsize Remington Bronze. It is ridiculously heavy and I have moved it or gotten cowboy to move it all over the house. It now stays right here. It is of a mountain man. 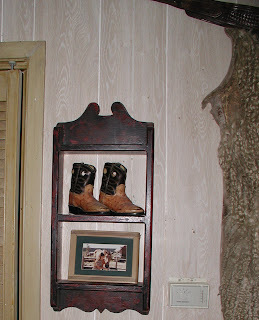 Then above it hanging on the wall are wholly chaps. The chaps we bought on a vacation trip to Rapid City South Dakota. We planned this trip in a matter of 5 days when we heard of an auction there. The chaps were bought at the auction. The chaps also have hung in many places. In our first house they were in the entrance hall along with the bronze. We had a curved stair case and they hung in the staircase wall. The bronze sat on an antique library table and was the first thing you saw when you walked in. These are fun peices because we have had them a long time and they have a lot of history with our family. The next photo I saved for last because I wanted to make sure you all looked at and read the rest. This photo has another pair of boots and I knew you would all love them. This shelf was originally pale lavendar and held elephants in my daughters room. (remember the elephant Show and Tell) Then it was painted red and black. I mentioned the red/black attempt at finishing the furniture (see the kitchen book shelf Show and Tell) Now it hangs in the den you can see the chaps beside it. (I usually cover the thermostate with the chaps but I need new velcro0 On the shelf are some really old boots. My nephew wore them. Then my son and then my daughter. I hope you enjoyed my Show and Tell these things in our den really do hold many memories for us. And it was fun sharing them with you and remembering. Come back and see me and please leave a comment. I have lots of posts in my archives. And on my Saturday posts you can read about my dog Daisy and her friends. Have a fun Show and Tell day! Here is Amy's wonderful illustration of God's awesome word. Thank you Amy. I usually use Amy's wonderful work on Wed. because it gives me a day off from blogging. Wednesday is the day that I pick up items from our local food bank to distribute to our clients. Our clients are teenagers that are on parole. They have been incarcerated and now are out in the "free". Some live with parents or other family members. And some live on thier own. Most are from low income families. We began this ministry in Jan. and started it with delivery for 10 families. Within 3 weeks we had added 10 more families. And, there is the need for more. At anyone time there is usually at least 70-80 kids on parole at our local office. Of course they don't all need groceries. But there is still a huge need for many of them. Many things have gone on the last few weeks with our ministry. Some good. Some not so good. But all God's plan. We recently lost the lease on our current location. So with moving everything out;finding temporary pantry and office space, and distributing I have been overwhelmed. Lots of extra work. So today I am especially grateful and thankful for Amy and her Wordfilled Wednesday. And to thank her I am passing on an award to her that I received yesterday. I'll be writing all about that tomorrow. So please come back and see what is happening. And, leave me a comment because I have to pass this award on to 10 others and if your reading me and not leaving a comment I can't come and see your awesome blog and make your day by giving you an award too! Please read my archives I write alot because I talk alot! Hope the rest of your day is Blessed. I am back to working on pantry now! Well it appears I am having one of the problems today that people complain about. I have been blogging for over a year now and this has never happened but this morning appears to be the day. This might not get posted because as I type I am getting an error message. 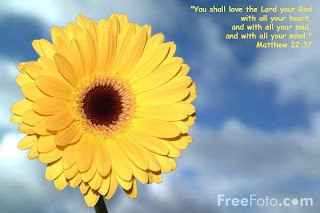 I was going to post Amy's lovely reminder of God's instruction for our lives. But it looks like that will have to happen this afternoon. Hmmm. Hmmm. What is up? What a sweet comment I found the other day. I was tagged! I have never been tagged before so I am sending a thank you to Joy@joy of desserts. She has the sweetest blog about desserts. And after going over and reading I decided she will be a close friend! We have much in common. So thanks again Joy. Here's the deal about the tag I am to write a 6 word Memoir. Next. Tara she writes at Faithacreafarm.blogspot.com I found her when she was getting her house ready to sell and she was redoing rooms. She has some wonderful decorating ideas. And she sold the house and now she has all these boxes in her posts! Of course Kelli at Theresnotplacelikehome. She is our wonderful Show and Tell hostess and just the best mom. The best decorator. And know she is doing a lot in her beautiful gardens. Whew she makes me tired. There is this new sista' I met over at anapronaday.blogspot.com she has the neatest vintage aprons and she writes about a different one everyday. Reall cool. Then there is Connie I met her through Show and Tell. Connie is a neighbor of mine she lives in the next big town North of me. Angry Chicken. I love to visit her blog. She is a wonderful mom and she sews her daughters cloths and she cooks and bakes. She has an adorable blog. Don't know where she got the name. Maybe if she plays along she will let us know. Amy she is at the 160acreawood.wordpress.com. She does an awesome Wordfilled Wednesday look at my sidebar and see some of her work. You'll love Amy's blog. Okey Dokey see you all later. 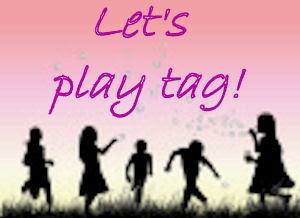 So now I am going over to my friends and let them know that it is time to play.